Seattle's palindrome enthusiasts and party time favorites Tacocat gets the plans rolling to bring the Northwest closer to the westward surf bound islands on, “Bridge to Hawaii”. The sounds coming between the city triumvirate of Seattle, Vancouver and Portland where the artists and bands are on this creative streak of freedom where everyone seems to be having fun and playing whatever they want play and hear. Exemplorary of this rule is the case of Tacocat, the house party poppers who first crashed through the doors of Hardly Art with their Take Me To Your Dealer EP back in 2011 now give us a taste of their upcoming full-length, NVM. With an album cover that depicts the album title made from a display of McDonald's PlayPlace-plastic multi-colored balls; Tacocat takes you down a tube slide into the Pacific Ocean in search of sand, surf, and fast-food diners. “Bridge to Hawaii” is the best escapist idea anyone has had in forever, and Emily Nokes sells the best piece of infrastructure the West Coast has heard about since the stalled dreams of high speed rail train systems. The verses ooze with metropolitan stress compressions, as Tacocat riffs on a free-beat rendering of surf licks that traverse out across the sea for their own Blue Hawaii. Cross the bridge, let Tacocat lead you to your own island in the sun, toll free. 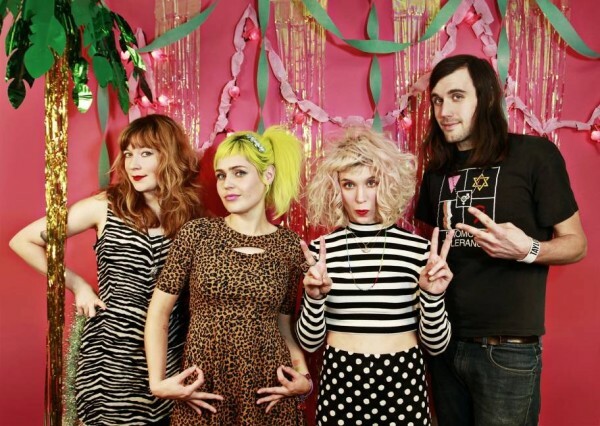 Tacocat's album NVM will be available 25 February from Hardly Art.